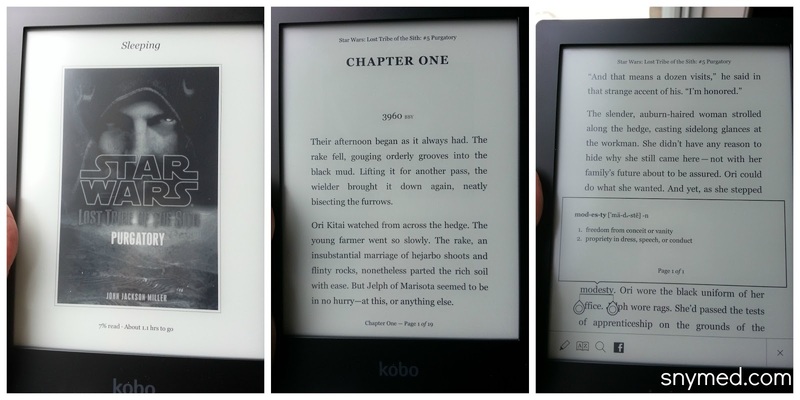 Kobo Aura HD Takes You Back to School! Review & CONTEST (~OVER~)! Earlier this year, I wrote Do We Need Paper Books Anymore?, which was also republished on The Huffington Post. While the article did attract many comments from people who are sentimental to books, we can all agree that paper books are greatly on the decline due to e-readers, tablets, smart phones, and other electronic reading options. In addition, paper books are not an environmentally friendly option, requiring the destruction of trees to create a book. And most persuasively, you can carry around a library of virtual books on an e-reader, but try that with paper books in your book bag! I agreed to test out a Kobo Aura HD, my first real e-reader ever. Yes, I already own a tablet, laptops, and smartphones, so I have done some e-reading on these devices. But what would the experience be like on a Kobo? Since I have summer reading all queued up for August, and I know that the kids will have lots of back-to-school reading to complete come September, I thought that I was up for the challenge. The Kobo Aura Arrives Powered On! Once my Kobo Aura HD was delivered to me, my impression was "why, this is small!" I guess that my point of reference was to the Apple iPad 2, which does have a larger screen. Then, as I lifted it out of its box, I thought "this feels about the weight of a book, maybe a bit heavier" I held the e-reader in my hand, and its thickness felt the way that a book does when I'm at the half-way point through my reading. I did find that it fit comfortably into either one or both of my hands, and that I did not have to bend back pages to keep the new book from closing (joke). When I looked at the Kobo Aura HD's screen, I did a double take, as it ships to the recipient turned on. But what I loved about it, is it is extremely muted to look at. It had been a concern for me that it would be glaringly bright and be hard to look at. This is absolutely not the case, and the brightness can be increased if you prefer it otherwise, or if you read at night. Looking inside the Kobo shipping box, I was a bit perplexed that it comes with only a USB charger and not a regular wall charger. 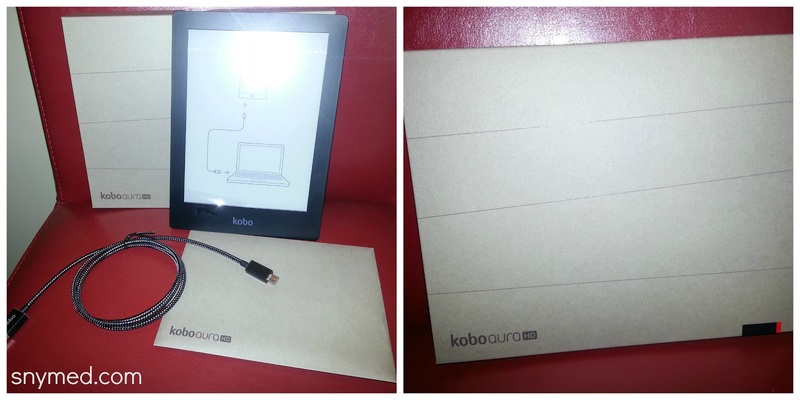 This means that out-of-the-box, you will have to charge your Kobo Aura HD using your computer's USB port. Like my Samsung Galaxy S3 charger, I would have preferred a hybrid wall plug/USB charger. I do use my HP laptop a lot, but I still find this charging option a bit inconvenient. What would happen if I needed to charge my Kobo but had not brought my laptop along? Getting started on the Kobo Aura HD, I found the onscreen instructions very easy to follow. I did have the choice of either connecting my Facebook to the Kobo, or creating a Kobo account without using my Facebook account. Easy enough. The instructions for navigating the Kobo while reading were also easy: touch anywhere on the right hand side (or swipe right) to flip ahead, touch anywhere on the left hand side (or swipe left) to flip back, touch the centre of the Kobo to make the "home" icon appear, click the "home" icon to go to the main dashboard (housing the library, bookstore and reading life), long-hold any word you see to make the dictionary definition pop up, and long-hold over a sentence or paragraph to either highlight the passage or add a note. There is a button to brighten/darken the screen, put the e-reader to "sleep" or shut down, as well as a port to connect the device to USB. There is a slot that allows the Aura to expand from 4GB to 32GB with a Micro SD card. As a newbie, it took me a while to figure out how to procure books for the Kobo, especially free ones. I tried Amazon.com, but quickly learned that Kindle books are not compatible with the Kobo. When I finally stumbled upon KoboBooks.com online, the browsing options were definitely better than the built-in Kobo Bookstore in Kobo Aura. However, once again I could not find free book options, and instead searched for such books by listing all available books from "lowest to highest". After I made several free book selections, I realized I had to "sync" my Kobo Aura in order for the new books to appear in my library. Once synched, all my books appeared--except for the two children's picture books I selected. I synched two more times, and even attempted to add another children's picture book, but the books did not appear. I'm still not sure why these books are not appearing in my Kobo Aura library, although the books are listed in my KoboBooks.com library. When I was searching for paid e-books, I was able to find many of the books I was looking for. However, I did not notice a way to reserve a new release that had yet to be published online. I think that this would have been a nice feature. 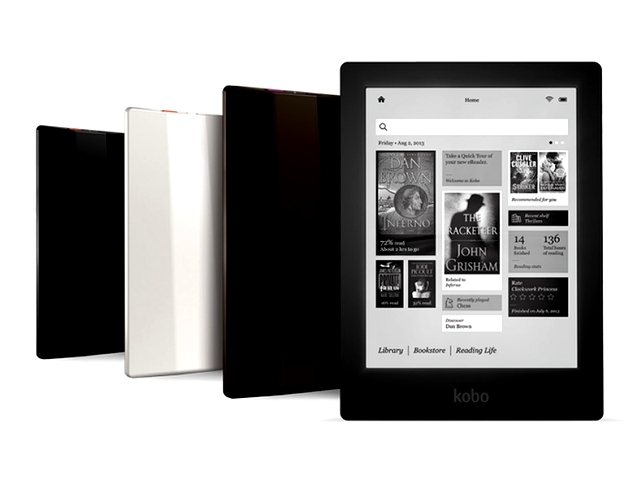 Meet the Kobo Aura HD Family! 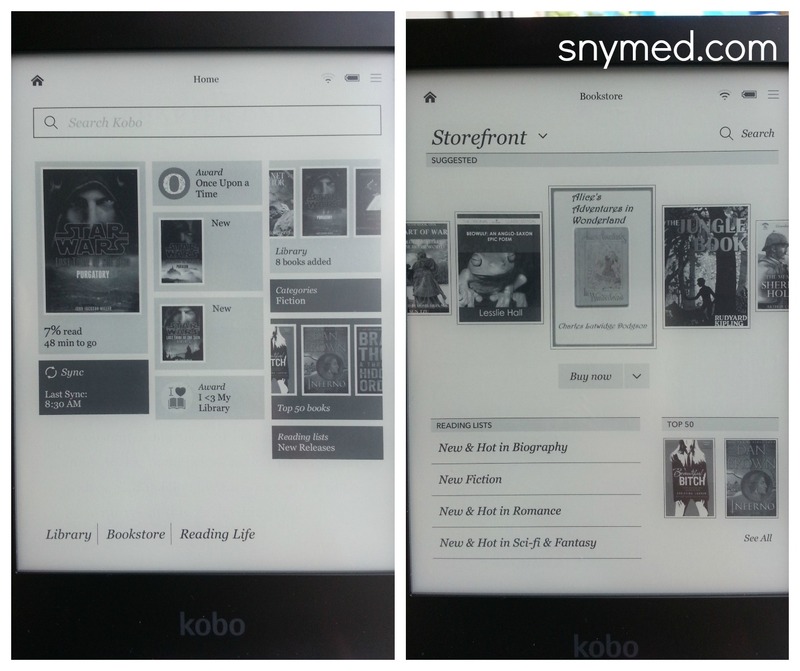 Once I tried out one of my new e-books, I did enjoy the experience on the Kobo Aura HD very much. Reading was effortless, and the default font and layout of the book was very similar to reading a paper book. The clarity of the words were also excellent. There is an option to change the default font, as well as font size, line spacing, margins, and justification. I did like how muted the "page" colour was, and it is a greyish-beige colour, rather than the whitish colour of a printed book. I find the muted grey colour of the Kobo Aura easier on my eyes than a printed book. If you are used to paper books, I think that you will find switching to the Kobo Aura not a stretch at all. From a tactile perspective, the Aura screen was smooth and yet slightly grainy at the same time. The surface was not the same as a tablet, and I liked this subtlety. When I needed to put my book down, the Kobo Aura remembered my place (without a bookmark, of course), and I could easily switch between books. I thought that the "reading life" feature of the Kobo was pretty cute, as it records your reading stats like total hours spent reading, page turns, average minutes per session, book progress (including by chapter), etc. Fun stuff for those who enjoy personal statistics. Some may say that I'm silly, but I was sorry that the book cover on the Kobo Aura was not in colour. Naturally it was not, as the Aura is a grey scale device. However, I thought I would put that out there, as I had not realized how much the book's cover had influenced me previously. Though, I can quickly admit that the cost to add colour to the device merely to have a colourful cover would not have been worth the price. The Kobo Aura HD can be purchased for $169.99 CDN, and is available in espresso, ivory or onyx colours. 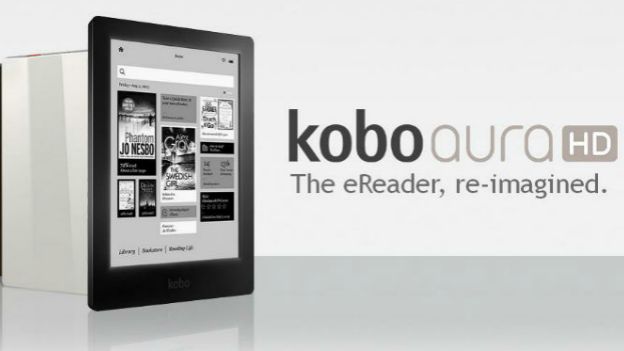 BUY a KOBO AURA HD or other Kobo Model HERE! Processor - 1 GHz; 20% faster than other leading eReaders. Display - 6.8" WXGA+ Pearl E Ink Screen. ClarityScreen+: 265 dpi, 1440 x 1080 resolution. Connectivity - WiFi 802.11 b/g/n and Micro USB. Storage - 4 GB. Option to expand up to 32 GB with a Micro SD card. BACK TO SCHOOL WITH KOBO AURA! The Back to School season is just around the corner! My kids were expected to do oodles of reading homework last year, and I anticipate this even more so this school year. Check out these literary works, all available from the Kobo eBookstore! -Ability to borrow titles from local libraries! Yes, you can borrow e-books from libraries now! FIVE WINNERS: Kevin L, Amy H, Seham M, Amy C & Judy C.
WIN 1 of 5 Kobo Minis from the SnyMed Blog! Yes, I'm giving away FIVE Kobo Minis to my great readers! 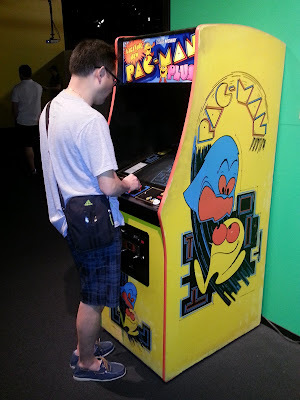 (Please note, the Kobo Mini is different than the device I have reviewed in this blog post.) 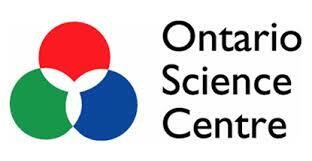 Contest open to Canada, ends Tuesday September 3rd, 2013...just in time for going back to school! Leave a COMMENT below stating what you would like to read on your new Kobo Mini, OR where you would read with your Kobo Mini. Then, use the entry form below to entry the contest. GOOD LUCK! 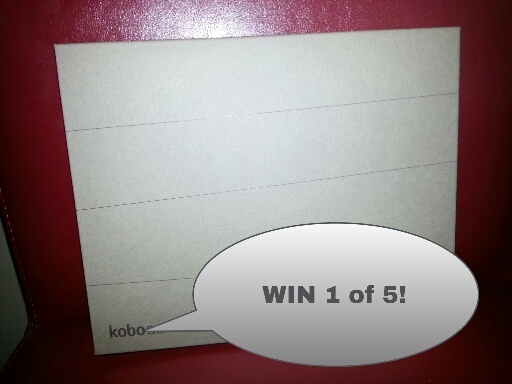 WIN 1 of 5 Kobo Minis! 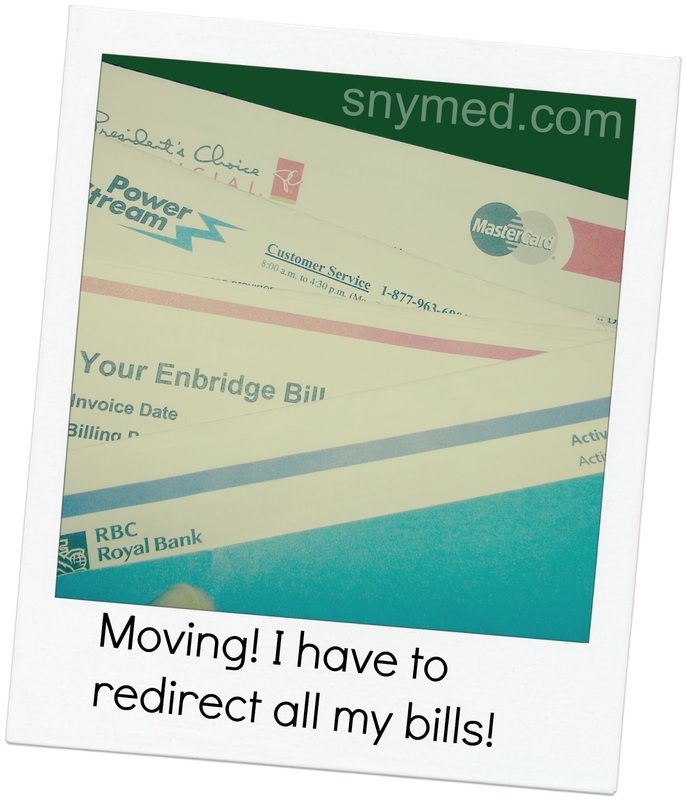 CANADA - Ends Sept 3, 2013! Shelf Safe Milk Doesn't Need Refrigeration! With 5 kids aged 3- to 8-years old, this year I will have 4 kids in school--which will equate to 4 school lunches to make! I want my kids to receive the proper nutrition while they're at school, but in my busy household I also need quick options. 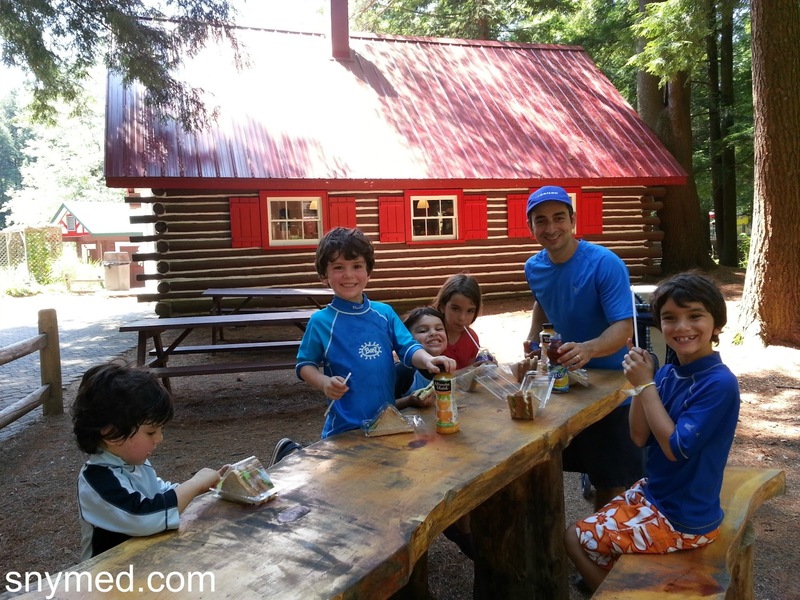 That is why Milk Unleashed is a worthwhile choice for school lunches, at camp, or on the go. Milk Unleashed is a shelf safe milk that does not need refrigeration, and is good for about 6 months until opened! "Long Shelf Life - It's Udderly Simple!" 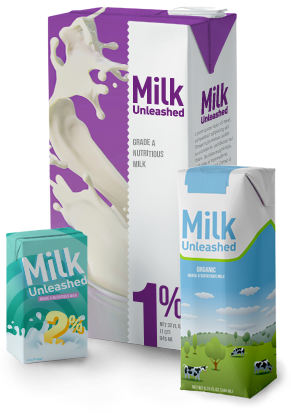 When I first learned about Milk Unleashed, it was hard concept for me to grasp that milk could be shelf safe and sit in a cupboard unrefrigerated. However, the process to make shelf safe milk is really not complicated: the Grade A fluid milk is ultra pasteurized and sealed in special Tetra Pak cartons. With shelf safe Milk Unleashed, I have lots of options when feeding and snacking the kids out of the house. For example, I can grab some cartons to enjoy after the kids' swimming lessons, instead of stopping by the drive-thru for beverages. I can tuck a carton inside my purse, and pull it out when my toddler needs a pick-me-up between meals. Or, even in the house, it is useful to have on hand when the refrigerated milk runs out like clockwork! Did you know that one carton of Milk Unleashed has 9 essential nutrients, including calcium, vitamins D, B12, zinc, niacin, potassium, phosphorus, magnesium and riboflavin? It is also a source of 8 grams of protein. Although it may seem hard to grasp, shelf make milk is real Grade A milk, with no preservatives or additives. Read here to learn more about the nutrition of shelf safe milk! As stated earlier, the milk does NOT require refrigeration until it has been opened--and it is just like the nutritious, wholesome milk that we already know so well! One of the greatest benefits of shelf safe milk is that is ultra portable, and there is never that worry that the milk will spoil when kept at room temperature. Try that with regular milk! Click here to find out where to purchase shelf safe milk! Follow Milk Unleashed on Social Media! 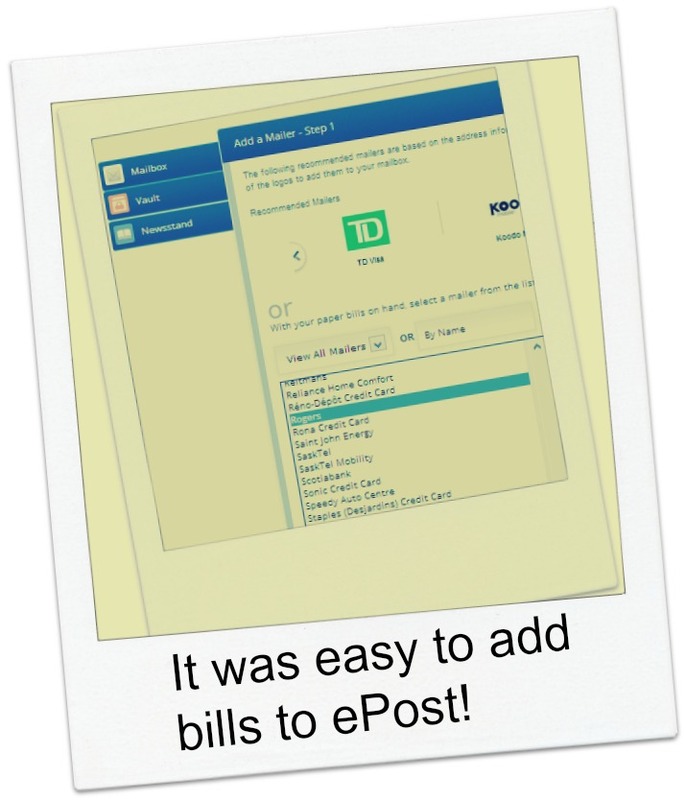 This blog post is part of a paid SocialMoms and Milk Unleashed blogging program. The opinions and ideas expressed here are my own. Have you ever tried shelf safe milk? What is your favourite way to enjoy milk? 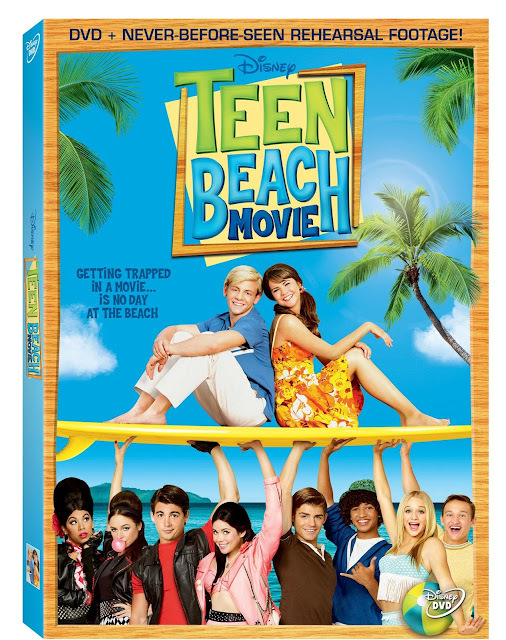 Disney's Teen Beach Movie Comes to DVD July 30th, 2013! Does your teen or tween enjoy music and dancing? 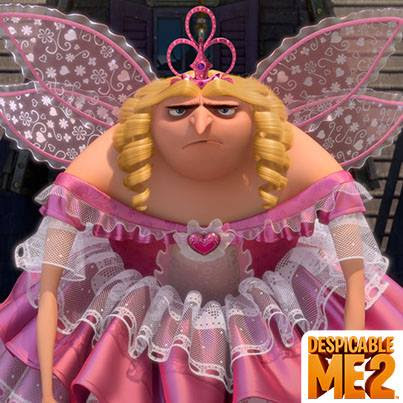 Do you like your child to watch clean movies that are free of swearing and grown-up content? Then check out Disney's Teen Beach Movie, coming to DVD on July 30th! Teen Beach Movie is about teenagers McKenzie and Brady who are enjoying a carefree summer of surfing and young love, until McKenzie must leave to go to a career-oriented high school. Brady begs McKenzie to stay and follow her own heart. But while McKenzie ponders the path her life should take, her surfboard glows magically--and she and Brady are transported into a surf movie called "Wet Side Story"! Anyone Want to Play Beach Blanket Bingo? Teen Beach Movie is quite nostalgic and a parody of surf movies of the 1960s. All the characters are dressed in retro beach clothing, and break into song and dance at the drop of a hat. It definitely is a feel-good movie summer movie, with musical sequences that are fun to watch. Needless to say, by the end of the film, McKenzie decides to follow her heart--and take charge of her own life. 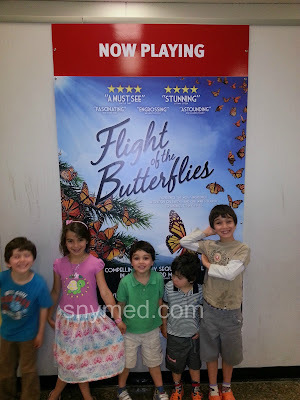 Although my kids are aged 3- to 8-years old, all kids did watch the movie through to the end (both boys and girls). My 8-year old and almost 7-year old both got the most out of the movie, although I did hear a big "yuck" at scenes in which a boy and girl were holding hands, I exchanging a kiss. Get your copy of Teen Beach Movie on DVD July 30th, 2013! WINNERS: Angela M. & Leanne M.
Leave a COMMENT below, stating if you've ever tried surfing OR what was the most fun way you've ever spent your summer. Then, use the entry form below to enter the contest. GOOD LUCK! My Review of Santa's Village, Discount Coupon, & CONTEST (~OVER~)! As a child, I had a long-standing envy of my brother because my parents had taken him to Santa’s Village in 1971—before I was even born! Year after year, my parents would play the filmed footage of my 3-year old brother at Santa’s Village feeding the “reindeer”, doing time-lapse photography tricks on park benches, and getting shoulder rides from my dad. How unfair: my parents had never taken me to Santa’s Village—never mind that I hadn’t been born then! Ever Wonder Where Santa Gets His Elves? 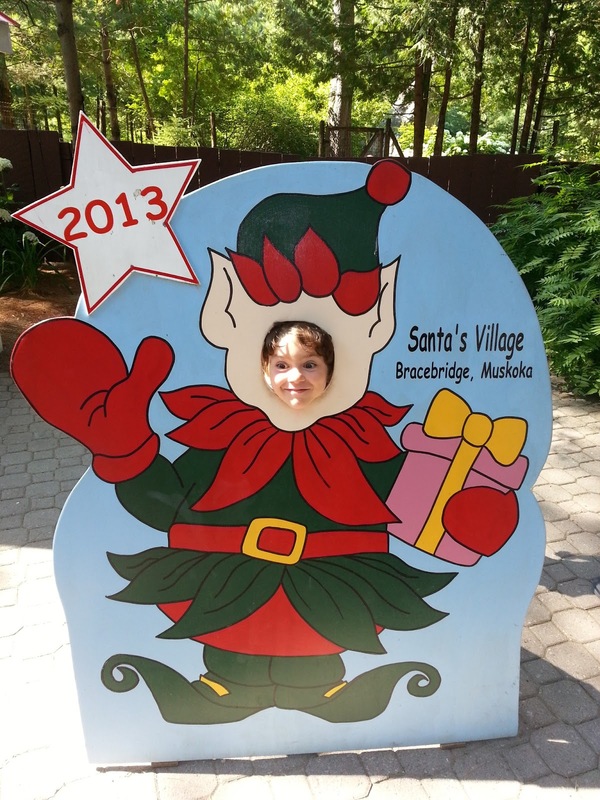 Well, all that changed this summer when I had a chance to take my family of 7 to Santa’s Village in Bracebridge, Ontario. 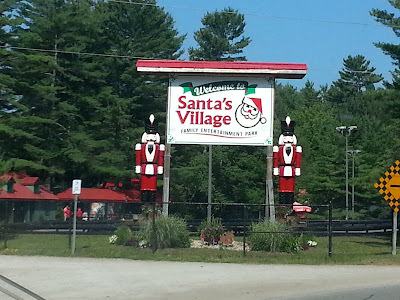 I wondered what it would be like to go with the kids to Santa’s Village, as the old school tv commercials ran through my head: “Everyone loves Santa’s Village! Everyone wants to meet you there!”, or something to that effect. I wondered if it would be very Christmas-y. 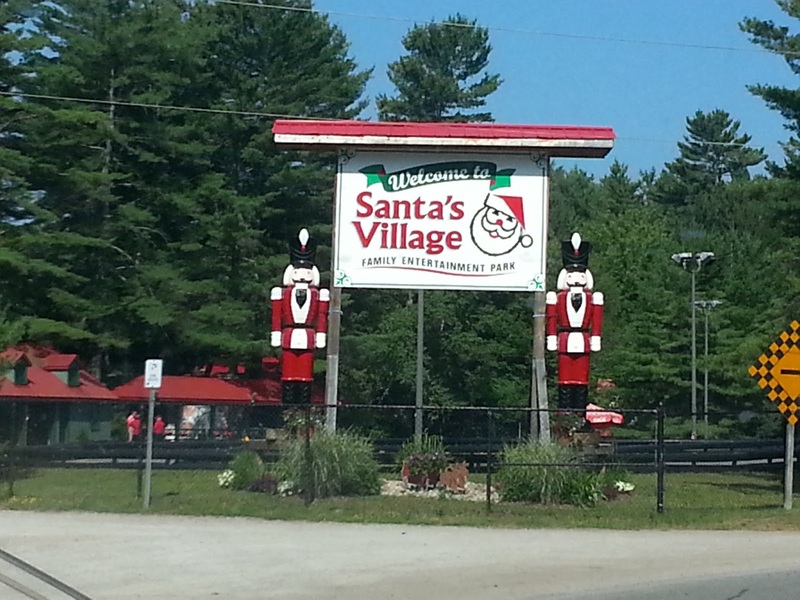 When we arrived at Santa’s Village, about 2 hours from Toronto, what struck me was how quaint it was. 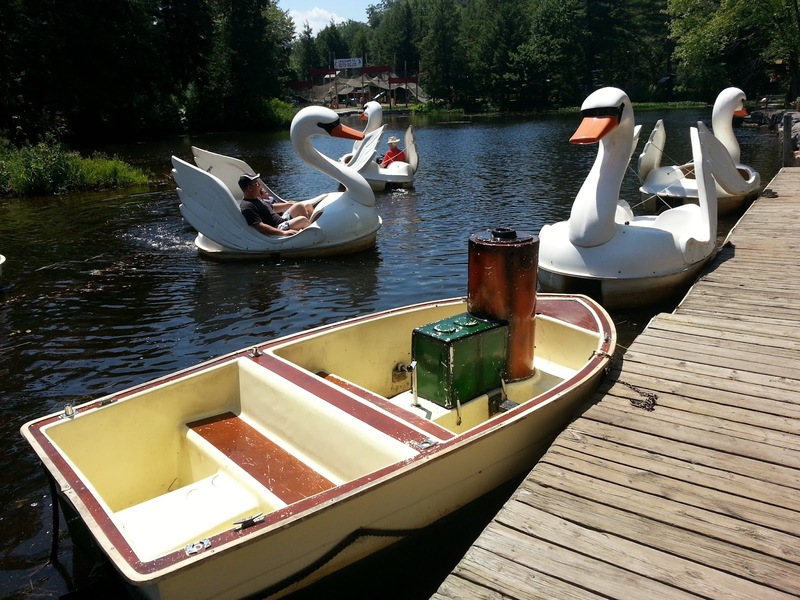 It runs alongside the Muskoka River and is surrounded by rugged Ontarian nature. The parking lot was intimate, not the usual parkade in which you have to remember your letter and number. There was a short line up at the main gates, not a throng of bodies, which was a nice change for me. Rudolph’s Roller Coaster Sleigh Ride sped by us up in the trees, which made the kids even more eager to get into the park. My Little Elves Snacking on Gingerbread Men! At the front gate, and everywhere else inside the park, the staff were friendly and helpful. Some may say this does not matter, but to me excellent customer service elevates a theme park and makes me want to come back. 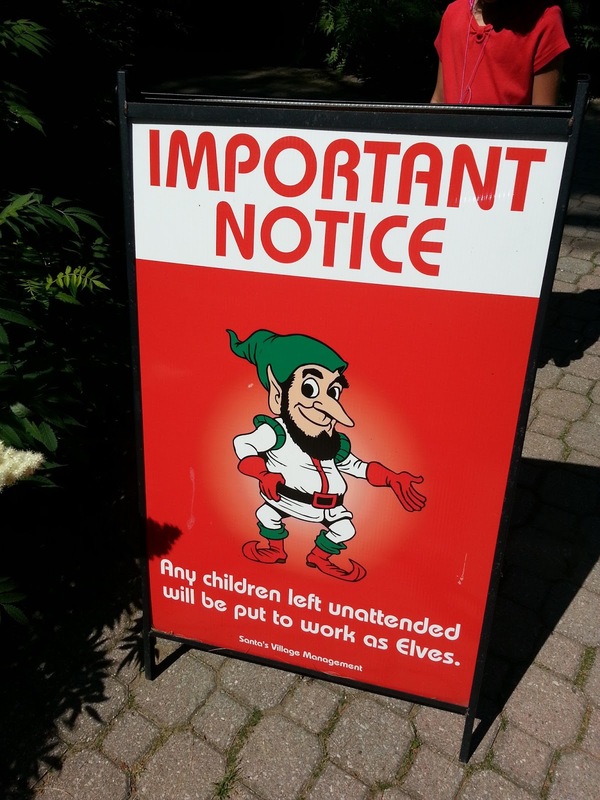 Once inside the park, elves hats could be purchased for the kids at $5 each. 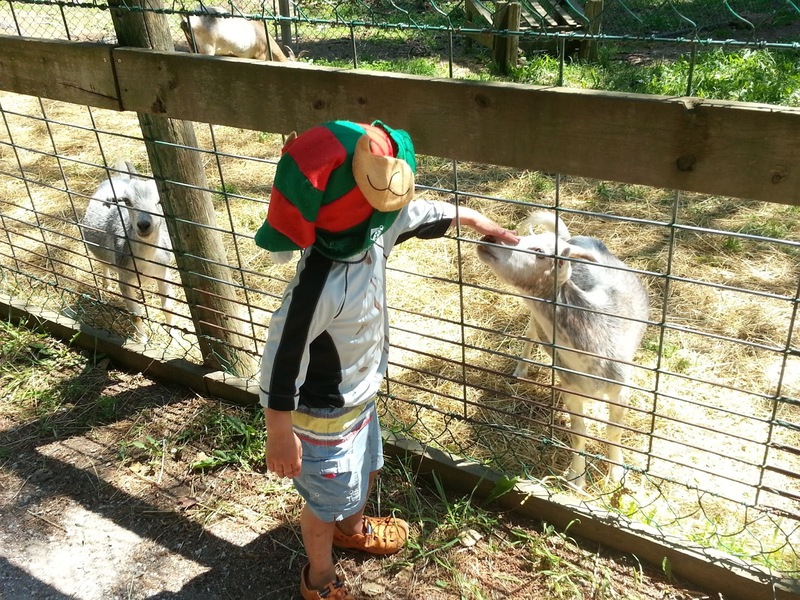 It was a sweltering hot day, and yet my kids loved wearing these green and red-striped hats with elf ears! As we came upon Mrs. Claus’ Bake Shop, the kids were suddenly hungry for gingerbread cookies—but no one wanted to share! Even my husband treated himself to a coffee. 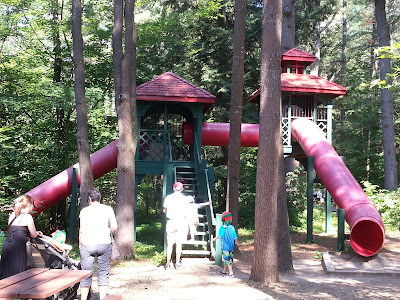 Across from the bake shop, there was a wonderful playground with tunnel slides, which the kids enjoyed very much. I loved that all through Santa’s Village, there were plenty of photo opportunities. Rudolph's Roller Coaster Sleigh Ride Roller Coaster! The kids insisted that we try Rudolph’s Roller Coaster Sleigh Ride, and there was absolutely no line up, which was the same case for most rides we visited on the Tuesday morning. All my kids aged 3- to 8-years old rode the roller coaster (accompanied by adults). The ride was themed by Rudolph the Reindeer guiding the flying “sleigh”. After the ride concluded, the kids wanted to go again, although I didn’t have the stomach for it. 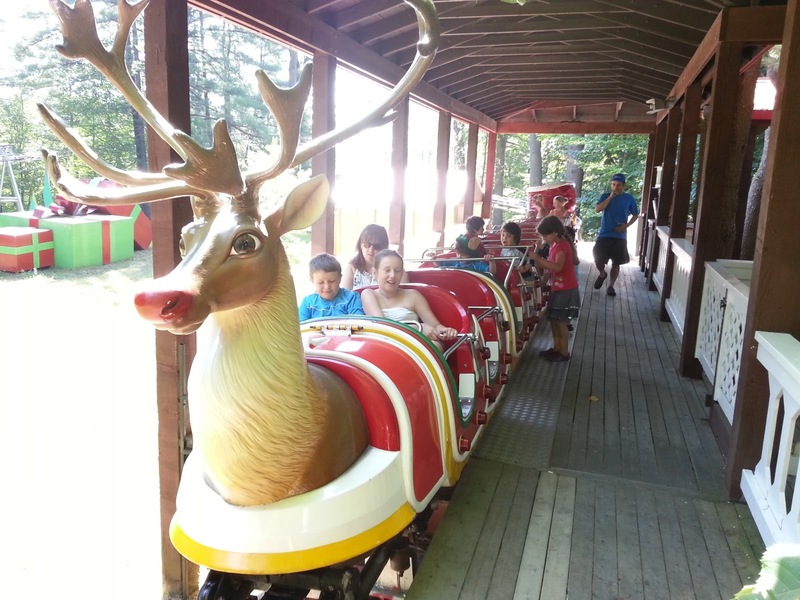 Enjoy a Ride on the Santa's Village Train! My littlest guys begged to go on the train ride, which runs through the Santa’s Village park. It was a great ride to take early on, as it shows all the upcoming attractions that shouldn’t be missed. If you have a Thomas the Tank Engine fan, I would absolutely recommend this ride (open to adults and children alike). Can You Guess Which Reindeer Is Rudolph? Next, we rushed to visit Santa’s Reindeer. I suddenly felt even with my brother, who had gotten to see these same deer in 1971 (joking)! 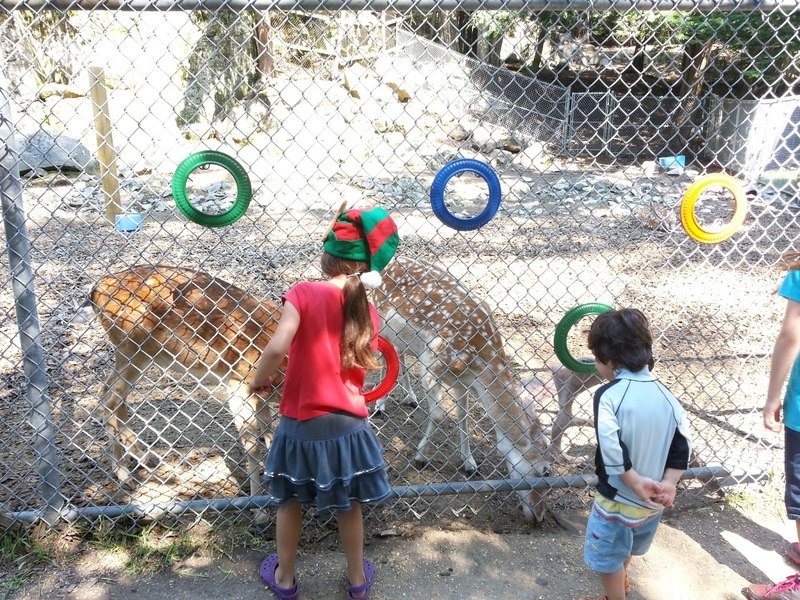 The kids loved petting them, and it was very cute how they had their reindeer names on the outside of the fence (Rudolph, Cupid, Dasher, etc). 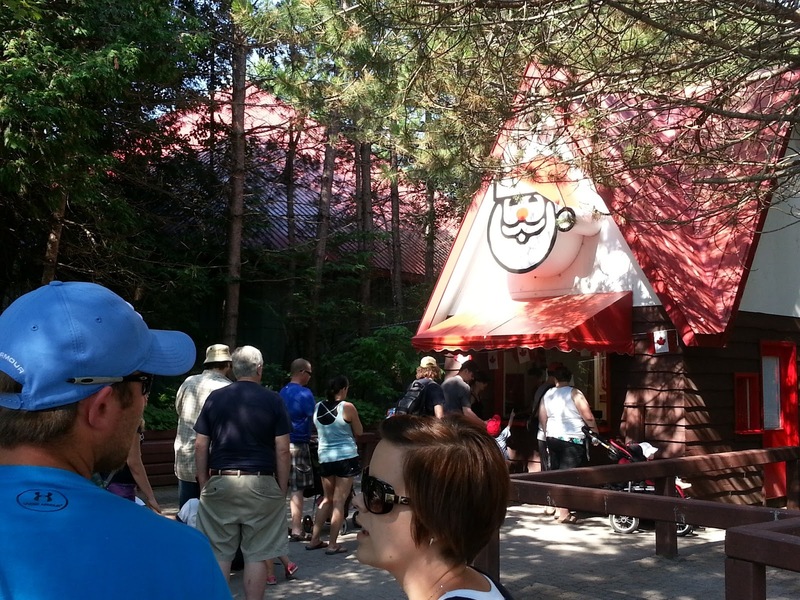 Visiting Santa In His Summer Home at Santa's Village! Can you guess who we got to meet next? It was Santa Claus himself in Santa’s very own House! The house was filled with gifts, Christmas trees and decorative lights. I had the option of purchasing a commemorative photo, or of photographing Santa and my family with my own camera. See Lots of Elves at Santa's Village! 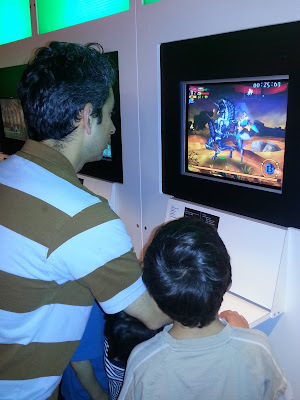 There was a 3D Theatre, but we were so busy that we didn’t have the chance to stop by. We passed the beach area and new Spray & Play splash pad, deciding to save it for the end of the day. It was a scorching hot day, and would be a great way to cool off the kids (more on this later). Christmas Ball Ferris Wheel at Santa's Village! 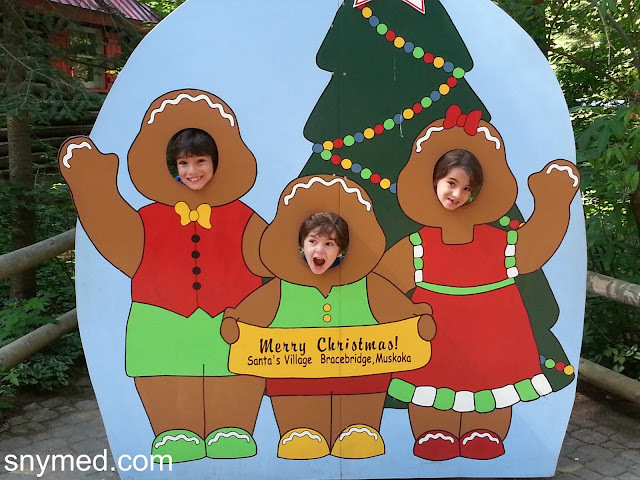 The kids really loved the amusement park portion of Santa’s Village. There was a really impressive Christmas Ball Ferris Wheel, Red Barron Bi-Plane Ride, Jumpin’ Star Kiddie Dropper Ride, and lots more. Before starting the rides, we decided to enjoy a real boat ride on Santa’s Summer Sleigh – Riverboat Cruise! The boat was captained by Captain Ricky, a veteran of 32 years at Santa’s Village! 2013 is his last summer of service, and then he will retire. 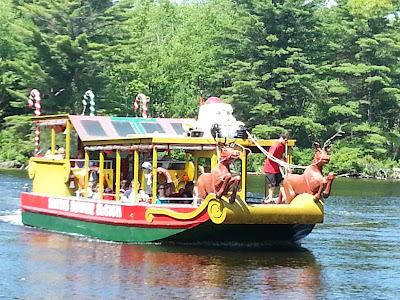 Enjoy a Boatride on Santa's Summer Sleigh Boat Cruise! Santa’s Summer Sleigh boat cruise on the Muskoka River was lots of fun and lasted at least 10 minutes, which is phenomenal by any theme park’s standards. 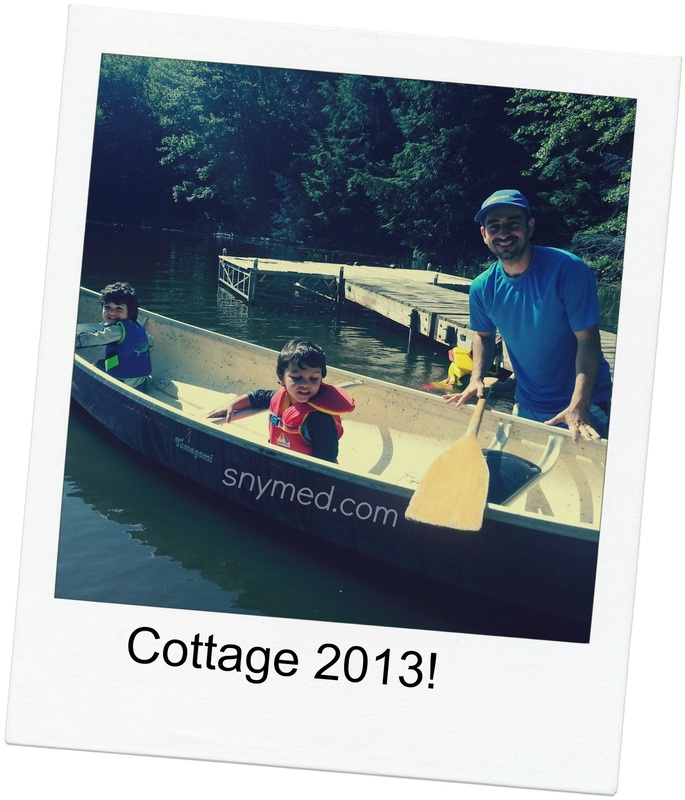 It was great to get the kids out on the lake and enjoy the surrounding nature. Burnin' Up The Track at the ATV Peddle Cart Atrraction! Did you know that Santa’s Village has an ATV Peddle Cart track? It’s like tricycles on steroids! My kids really went nuts on the ATVs and didn’t want to leave. I loved how it kept the kids active and engaged at the park. Take To The Sky On The Red Barron Bi-Plane Ride! Santa’s Village also had 2 bouncy castles, a carousel...and I already mentioned the Red Barron Bi-Plane Ride! 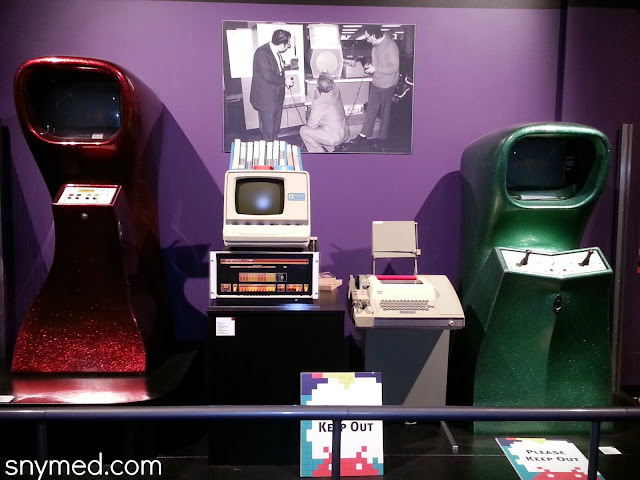 In a previous blog post I mentioned that I love Red Barron rides, as I fondly remember such a ride from my childhood! It’s so cute how the kids get to fly their own airplane, or can team up with a sibling. 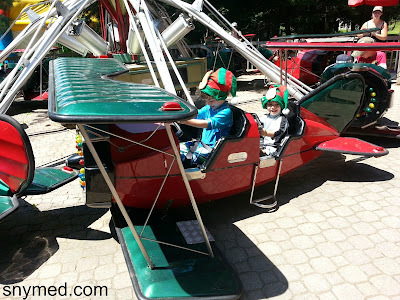 VIDEO: Jumpin' Star Kiddie Dropper Ride! (See VIDEO above.) The Jumpin’ Star Kiddie Dropper Ride was an amazing miniature version of the adult ride, in which riders are hoisted up with legs dangling, then dropped down! Of course, in this children’s version, the drops are a little less pronounced. The kids wanted to ride again, but poor dad was a little too green for a second go! 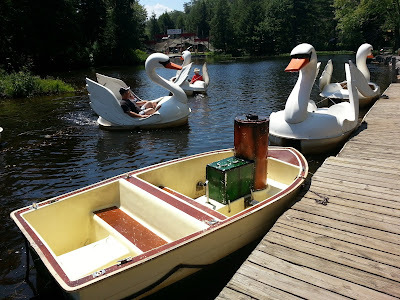 I was really excited for the Swan Paddle boats—until I realized they were parent-powered! 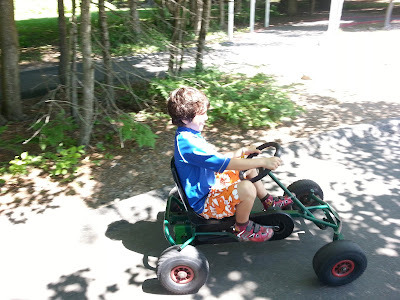 Parents, here’s my advice to you: get the kids to peddle! If you’re in a large group, ask for the foot-powered rowboat. Life jackets provided for the kids. If you’re planning on visiting Santa’s Village and looking for healthier food choices, try the Treat Retreat. I was impressed that they had sandwiches on brown bread, yogurt, fruit, nuts, snack bars, milk, water, and juices. It really made my day that I could feed my family with more healthful food—and at a theme park too! 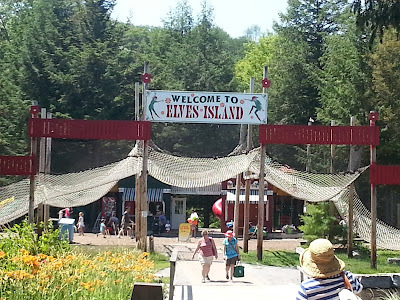 Try The High Ropes At Elves Island! Close to the Swan ride was the bridge to Elves Island, a massive playground for the kids. I recommend that you stop by, and guarantee that your kids will enjoy it. What made it unusual from regular play areas, was the giant overhead ropes course that were perfect for challenging the older child. Set on the Muskoka River. On the bridge back from Elves Island, was Santa’s Farm petting zoo. It was nicely shaded and the kids loved getting close to the animals. 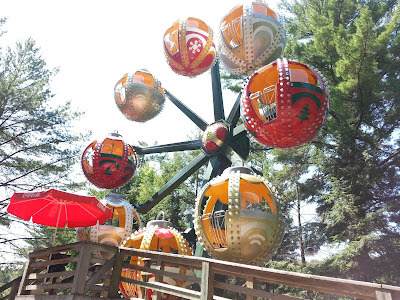 Also part of Santa’s Village is Sportsland, an area of Laser tag, an arcade area, mini golf, batting cages, a picnic area, go-carts, bungee trampoline and rock climbing wall. The Checkered Flag Is Mine! 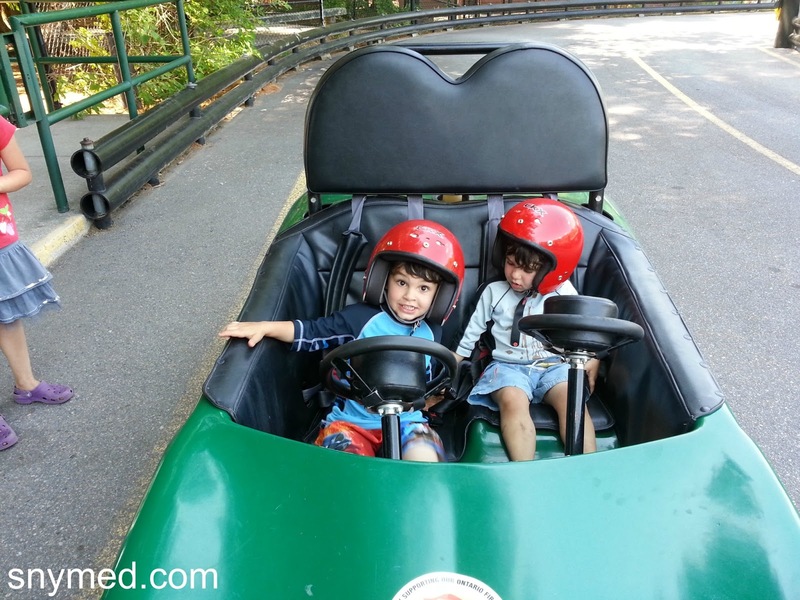 Do I need to say that my kids loved go-carting? Or should I say, that my husband loved it more? Dad and the kids had a great time zooming countless times around the track. Protective helmets provided. VIDEO: Bungee Trampoline at Santa's Village! It was hard to find a best part about Sportsland, as the racing cars were pretty great. However, the bungee trampoline was a thrill-ride for the kids. Each child was hooked up to a safety harness, and had a personal handler to assist him or her. The kids took in some serious air, and my daughter was gutsy enough to do endless aerial backflips. Don’t miss the bungee trampoline if you visit Santa’s Village this season! 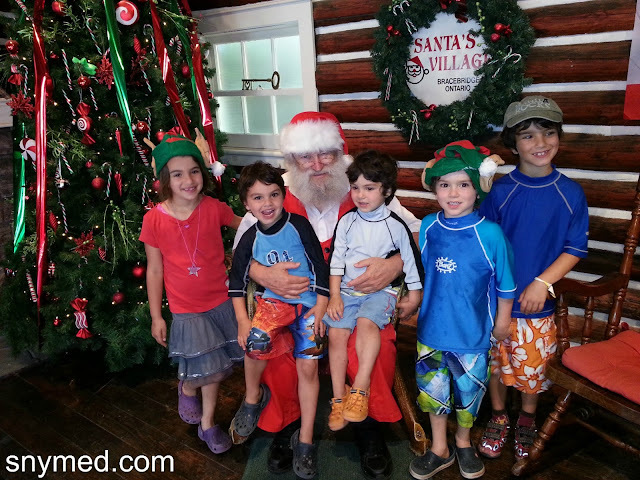 Bring Your Swimsuit & Towel To Santa's Village! VIDEO: NEW Spray & Play Beach at Santa's Village! 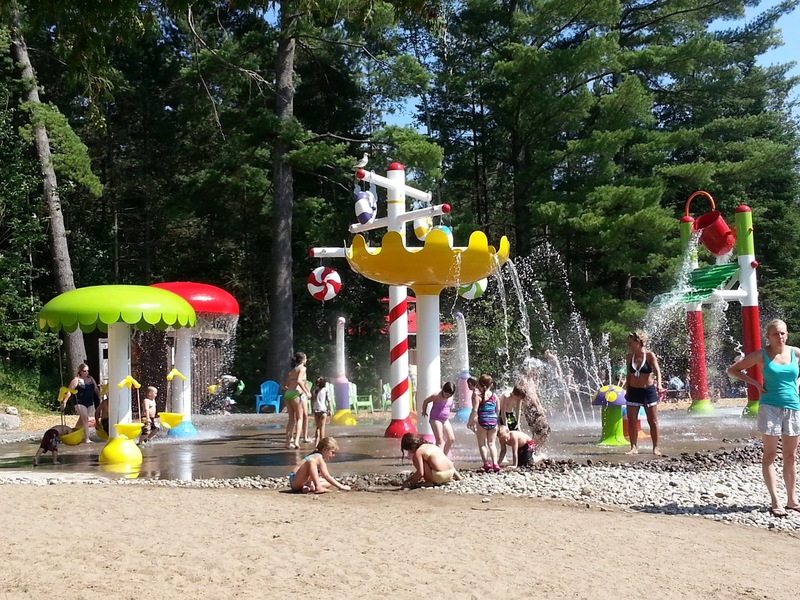 Last but not least, the kids cooled off at the Beach Area and the NEW Spray & Play Beach (splash pad). I already had the kids in their swimsuits, but there was a family area had I needed to change. There was a candy cane fountain spraying peppermint water (joke), and a candy-themed splash area that was fun and brightly coloured. Nearby, there was a sandy beach and a cordoned off shallow area of the Muskoka River, so the kids could swim. There were muskoka chairs for the adults, and fun was had by everyone! Don’t go unless you want to get wet! Visit Santa's Village in Bracebridge, Ontario, Canada! My family really had a fantastic visit to Santa’s Village in Bracebridge, Ontario, and I would highly recommend it for you and your family. We stayed for 6 hours in total (in +33°C weather), and would have stayed longer had the weather been cooler. 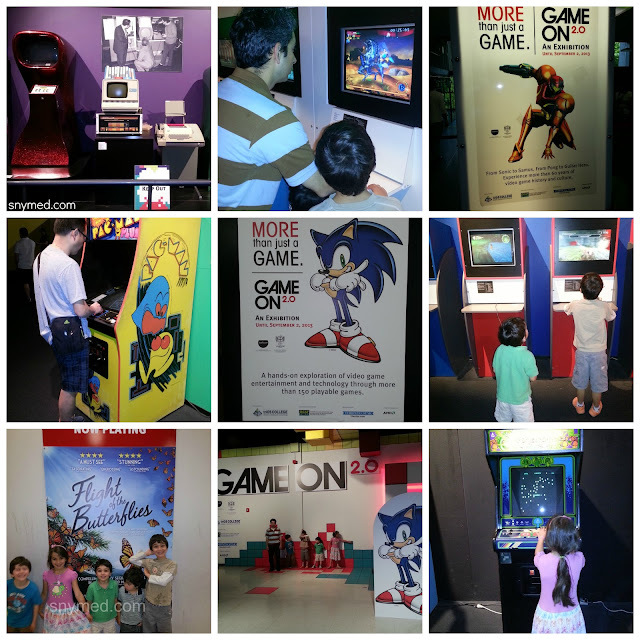 If you live in Toronto, the GTA, or Ontario in general, this would be a perfect trip to make as a family! 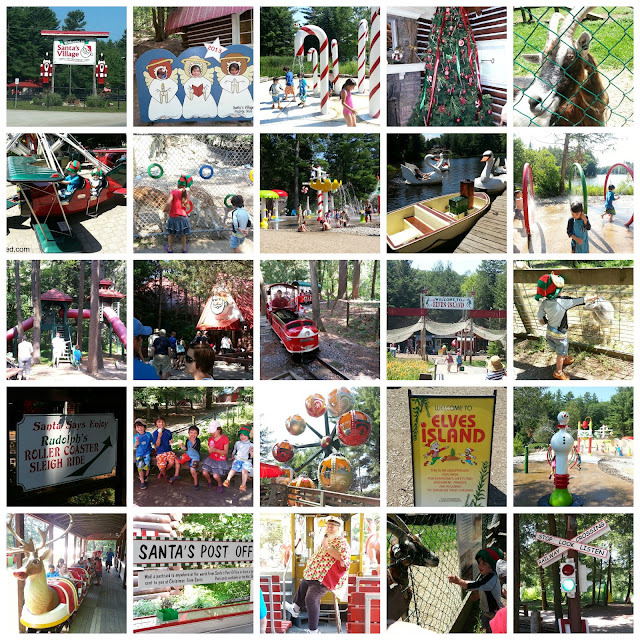 Click Here For A Santa's Village Buy 1, Get 1 Admission 50% Off Coupon! 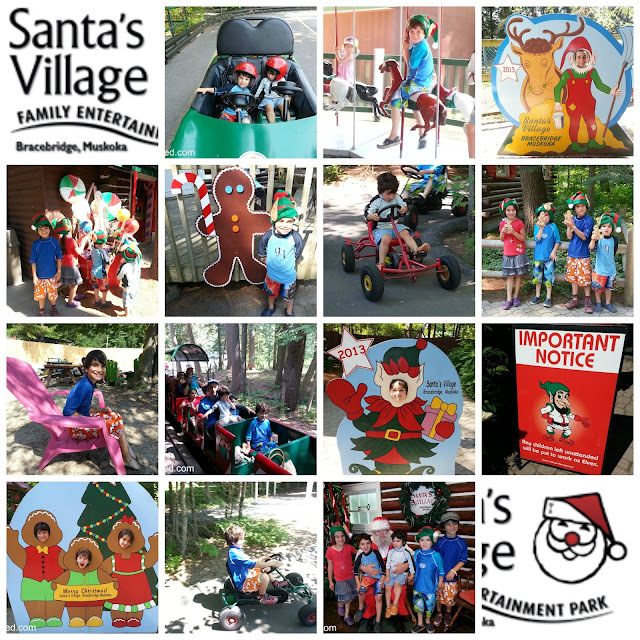 There's Lots To Do at Santa's Village! 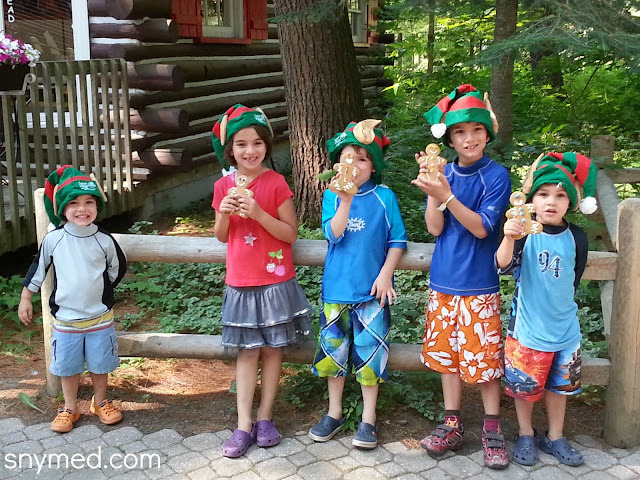 WIN Family Passes (for 4 people) to visit Santa’s Village this season! 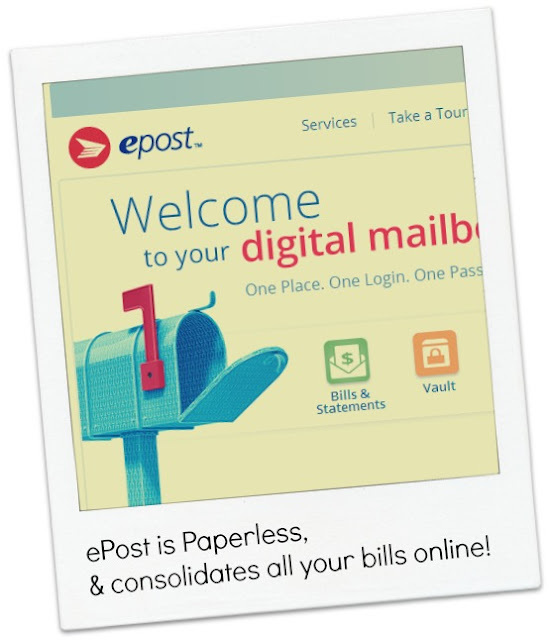 Passes expire September 8th, 2013. Contest ends Friday August 9th, 2013. Open to Canada. Leave a COMMENT below stating: Have you ever been to Santa’s Village before OR What would you say to Santa if you saw him during the summer? Then use the entry form below to enter the contest. GOOD LUCK! WIN Santa's Village FAMILY pass for 4 people! 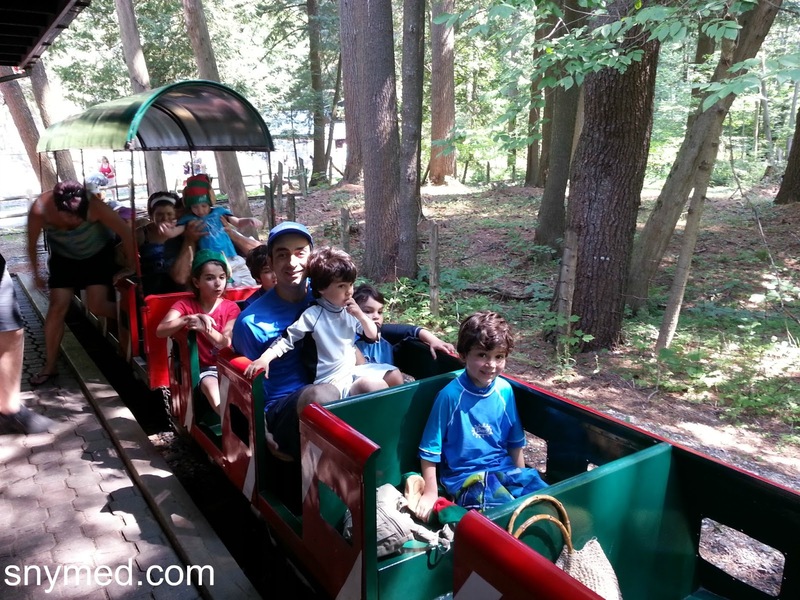 With the sudden heatwave in Toronto, we've tried to find cool activities for our kids! We've cooled ourselves down by visiting the splash pad, by dunking in the lake, and by eating icecream. But it's a nice treat for the kids to watch the Disney Junior channel in the air conditioning inside! The month of July is a great month for Disney Junior, including new episodes of your child's favourite shows, and wonderful Saturday Night Movies! A Perfect Princess & Pirate Summer! During the months of July and August, your child can watch Jake and the Never Land Pirates followed by Sofia the First, weekdays starting at 6:30pm EST, running all summer long on the Disney Junior channel! A new episode of each show will air every Monday, so be sure to set your PVR! Check out DisneyJunior.ca for great princess and pirate summer games and activities that your child will enjoy! It's Princess Belle All Dressed Up! It's no secret that my daughter love to dress up! Ever since she was just 18-months old, she has loved dressing up like a princess. 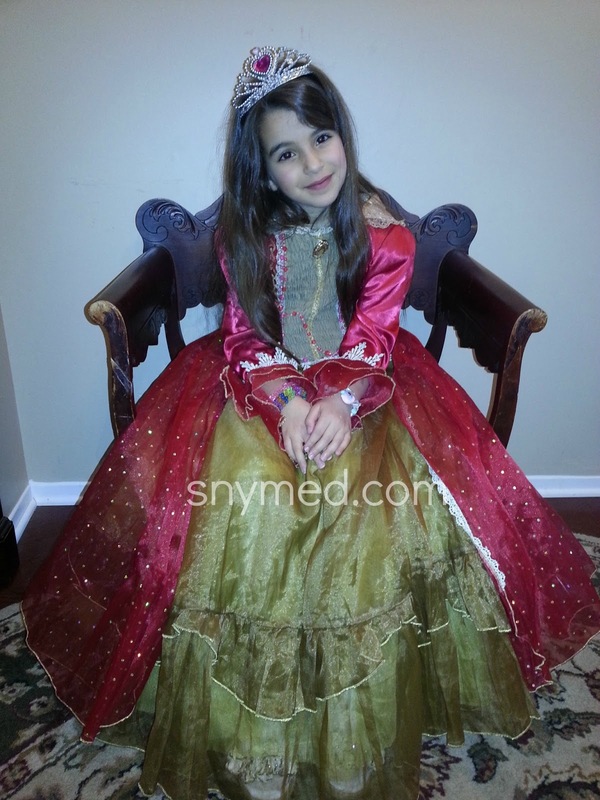 In the photo above, she is dressed up as Princess Belle (dress shown from the Disney Store). Putting together a princess costume is very easy: just take a party dress or fancy nightgown in lieu of a Hallowe'en-type costume, and pair it with costume jewellery like a bobble necklace and bracelet ($1 from the dollar store). In lieu of the real deal, you can make a beautiful crown out bristol board, construction paper, or cardboard. Your child can paint it her favourite colour, and add beautiful touches like glitter, sequins, rhinestones or stickers. Here are instructions for a basic crown, if you're looking for inspiration! Saturday Night Movies With Disney Junior Canada! 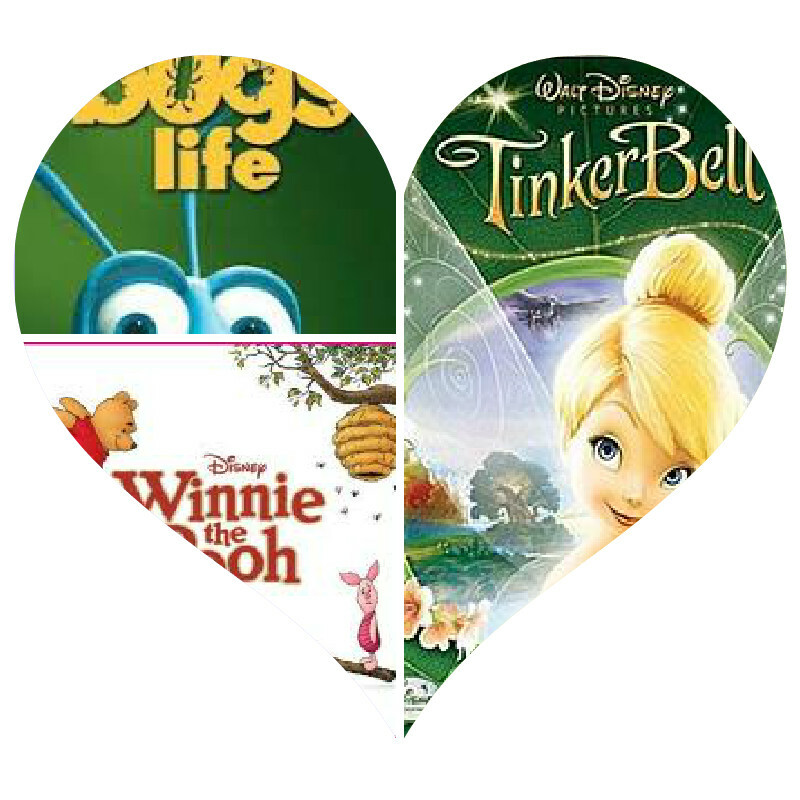 Check out this great list of movies from Disney Junior Canada, every Saturday night this summer starting at 6:00pm EST! Watch commercial-free as a family without interruptions, and set your PVR to watch again later! *Enjoy the premiere of this brand new movie! Check out the Disney Junior Canada website for adorable Winnie-the-Pooh activities, including Pooh colouring sheets and the Pooh online games! 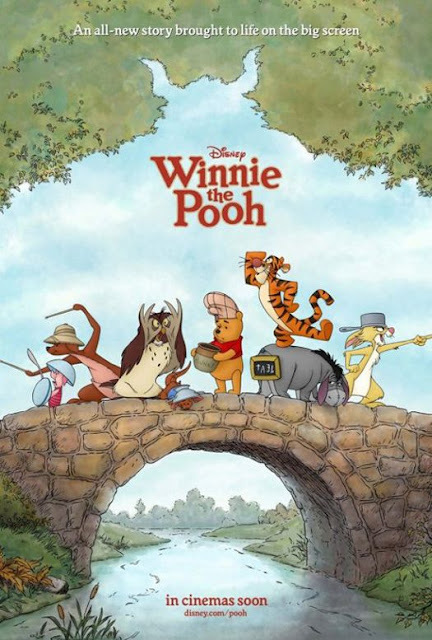 A great place to start if you're planning a Winnie-the-Pooh themed birthday party this season! My family are avid movie watchers, and we love enjoying movies old and new together! We first get the kids ready for bed, and then we begin the ceremony of choosing the family movie. The kids take turns picking which title to watch, but when a turn is called into question, we take votes--and majority rules! My kids love to snack, so cut up carrots and celery are a snack of choice, or sliced fruit like apples or oranges. In my household, movie night truly is a family affair, and both mom and dad always participate. 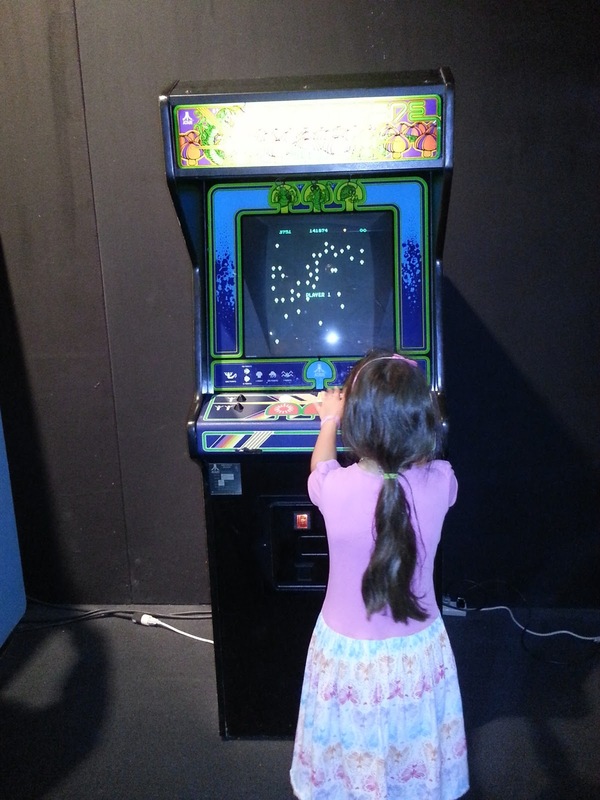 What activities have you been up to this summer with your kids or grandkids? Are you planning on watching Tinker Bell this Saturday on Disney Junior? Or how about the premiere of Winnie the Pooh on Saturday July 27th?